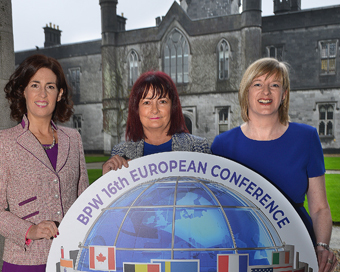 The International Federation of Business and Professional Women (BPW International) has chosen NUI Galway as the location for their 16th European conference, promoting women’s professional and leadership potential at all levels. Pictured are Hildegarde Naughton, T.D., who joined Carmen Taheny, National President of BPW Ireland and Mary McGinley, Director, KPMG at the Aula Maxima, NUI Galway recently to announce details of the event which takes place on campus in May. Hosted by BPW Ireland and sponsored by KPMG, the conference will take place from the 24th-26th of May with between 400 and 500 delegates from 30 countries throughout Europe expected to attend and bring a significant positive economic impact to Galway over the weekend of the conference. Speakers for the conference include the President of Malta, H.E. Marie-Louise Coleiro Preca; Galway West TD, Hildegarde Naughton; Chairperson of the National Women’s Council of Ireland, Ellen O’Malley Dunlop; Geraldine Swarbrigg, Inglot Cosmetics; Josephine Feehily, Chair of the Policing Authority; Aedhmar Hynes, Global Communication Professional; Gary Hynes of Druid Theatre and Evelyn O’Toole CEO CLS. BPW International is one of the most influential international networks for business and professional women with affiliate organisations in 95 countries, including 20,000 members across Europe. Founded in 1930, the organisation is an advocate for women’s rights including workplace equality and equal pay. Its members include leaders, entrepreneurs, business owners, executives, professionals and young career women.